Everybody loves a tasty sushi or sashimi platter and wishes to be able to create restaurant-quality sushi at home. But with an ordinary knife, it is hard to achieve a similar professional look that you get in the restaurants. But sushi knives can be very expensive almost to the point that it will hurt your wallet. Hence, before you head to the shop to make a purchase, it is very important that you know the basics of sushi and sashimi knives. So, if you are interested in investing in the best sushi knife then you have come to the right place. We have written this article to give you all the information that you need to know about sushi knives which will help you to choose the ideal one for your kitchen. Let’s have a look. Japanese sushi knives and Sashimi knives are specially crafted for precise slicing and also need to be handled in a certain way. Sushi and Sashimi are two very different dishes in Japanese culinary which is why there are particular differences in a sushi knife and a sashimi knife. Sushi can be of many forms and includes several other components whereas; sashimi is mostly about the precise cut of the fish. While making sushi rolls it is evident for the knife used to be capable of slicing not only the delicate fish but also the vegetables and the roll too. Hence, a sushi knife is crafted keeping all these factors in mind whereas; a sashimi knife is designed specially to produce precise cuts of fish. Sushi knives are typically made up of high carbon steel instead of stainless steel which makes them more prone to corrosion and rust. Sashimi knives are made with a single sloping edge so that the fish can be cut with absolute precision and doesn’t cling on to the knife. There are some knives that are also manufactured so that they are eligible for both the purpose. But these knives need to be extremely sharp in order to cut the fish perfectly. While buying sushi or sashimi knives you must have often heard about a single bevel knife, but what is it really? It is a very common and a significant feature that the best sushi knives must have. A single bevel knife is the one that is crafted with a sloping edge only on one side of the knife, which is where the single bevel name comes from. These knives have an inclining angle made while they are sharped so that the food doesn’t cling to the blade while cutting it in fine slices. There is hollow ground on the back side of these knives. 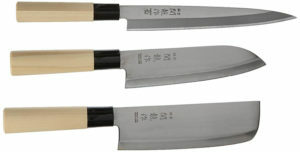 Some common single bevel knives are Deba, Usaba, and Yanagiba and are all excellent tools for slicing sushi and sashimi. Are Budget Sushi Knives OK? Looking at the price tag of a sushi knife can be agonizing given that a traditional sushi knife can cost over 200 dollars. So is normal if the question lingers in your mind whether you can use a normal slicing knife instead of a sushi knife to perform the same task. The answer to that is, yes, you absolutely can. A sharp slicing knife will cut the sushi rolls perfectly. However, the specialty of a sushi knife is its precision in cutting. Sushi knives are made with extremely razor sharp blades made of high carbon steel, which is designed to but thin and fine slices. These knives are effective in cases of presentations and a staple tool in any restaurant’s kitchen. But if you are a regular home cook, then you can easily pull off the task with a normal slicing knife instead of spending hundreds on sushi knives. But if you really want that restaurant quality sushi with premium taste and cut, then you must invest in the best sushi knife brand. 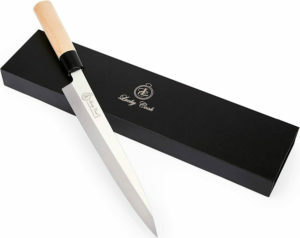 This lucky cook sushi and sashimi knife is an ideal fish slicer that can cut through the flesh with extreme precision. 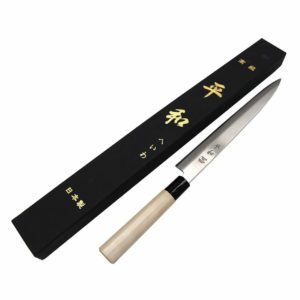 This sushi knife is 10 inches in length and is ideal to slice and fillet any moderate or large sized fish. The blade of the knife is crafted with superior quality stainless steel and is a perfect tool for slicing the tantalizing flesh of the fish. This gives the knife sharpness and makes it resilient to rust. The blade has been made asymmetrical so that the chef can easily slice the fish off with one stroke. The knife comes with a high-quality wooden handle which is comfortable to hold on to for a long time and also provides balance. Overall, the superior quality of this knife can slice the perfect sushi rolls and sashimi. The best part is that you won’t have to spend hundreds of dollars for this knife as it retails at a very reachable price and is a must to invest in. 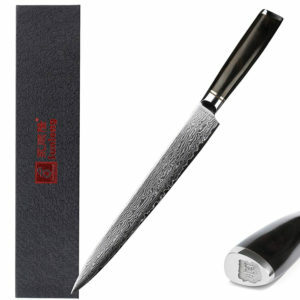 If you are seeking for a premium quality traditional sushi and sashimi knife then this one is the one to opt in for. This is a classic professional Gyuto sushi knife with a single beveled cutting edge. This knife has been created form a high carbon stainless steel which makes it extra resilient and prevents it from rusting over time. 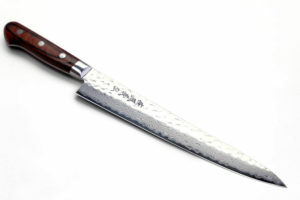 Not just that, the high carbon material makes the knife extremely sharp which is a staple quality for any sushi knife. The single beveled edge on the knife is an ideal characteristic that has to be present in a traditional sushi knife. This allows the knife to cut the fish and vegetables with precision and avoids them from sticking onto the surface of the blade. The knife has been crafted out from a full tang making it extra strong and resilient. The handles have been made from rosewood which has a great reputation for longevity and holds the polish for a longer period of time. 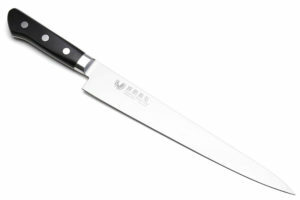 This is a knife that is highly recommended by professional chefs as well due to its performance and ability to cut perfect sushi slices. 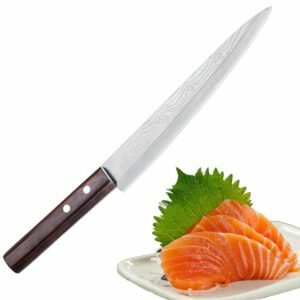 If you are a passionate cook and are ready to invest in premium quality and unique sushi knife then there cannot be a better option for you than this one. This is the patent-pending creation of Cangshan, one of the renowned brands for sushi knives, and is a must to have for your kitchen if you love sushi. 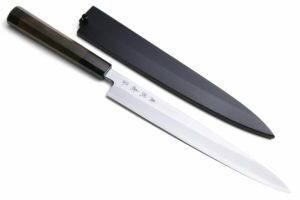 This knife has been created with extremely high-quality Japanese steel that is razor sharp and strong at the same time. The blade is of 12 inches in length and can ideally slice any fish with extremely delicate flesh which makes it perfect for preparing sashimi. The handle is created with dense and rich African blackwood that looks super stylish and gives you proper balance while cutting. The knife also comes along a Saya styled wooden magnetic sheath which makes it convenient for storage. 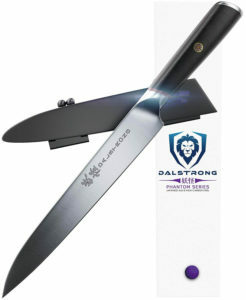 When it comes to knives and kitchen tools we cannot forget to bring up the name of Dalstrong. Dalstrong has crafted a professional quality sushi knife that has won the hearts of many chefs and home cooks. This traditional sushi knife is claimed to be the powerhouse of any sushi knife. The blade has been created from high-performance Japanese steel that makes the blade extremely sharp to slice any fish with precision without any kind of pull or tear. Like any other traditional sushi knife, this one has a single beveled edge which prevents the food from clinging on. To further strengthen the knife, the blade has been honed and cooled in nitrogen in order to escalate the flexibility and strength. As the knife has been crafted from a full tang it is very durable and strong and will last for a long time if maintained well. The pakkawood handle will provide you with comfort, and stability while you slice your favorite sushi. If you are someone who would love to invest in a good set of sushi knives instead of investing all your money in one, then you should give this Hiroshi Knives set a consideration. 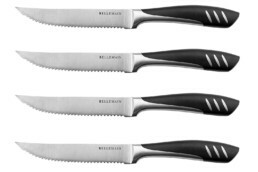 This set of 4 consists of 4 different sushi knives which are widely used by professionals. These knives have been crafted to have the sharpest high carbon blades so that you can effortlessly cut through the fish for making your sushi. These knives have been handmade, sharpened and accumulated completely by hand. The handles are made with the lightest material so that you don’t have trouble handling it for longer periods of time. 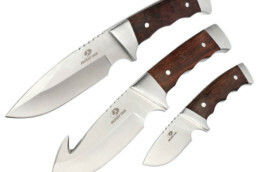 There are four different sized knives in the set, hence, you can effectively use them on fish of any size you desire. The high carbon blades will provide you with ease to cut the fish and create our favorite sushi rolls effortlessly. Yoshihiro is a renowned brand that manufactures sushi and sashimi knives of professional grade. The knives that this brand creates not provide you with the premium performance but have the most classy and elegant look imaginable. This is known as the Yanagi sushi knife and is widely preferred by sushi chefs around the globe. The blade has been crafted from stainless steel of Inox Aus 8 high carbon and is therefore very sharp and resistant. For a sushi knife, it is vital to have that single slant bevel edge so that the slices can be fine. 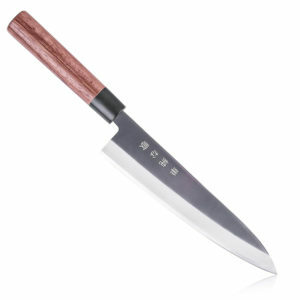 This knife justifies all the qualities of a traditional sushi knife and comes with a spectacular, cheek rosewood handle. The knife comes in a black Nuri Saya sheath that gives it an elegant outlook and protects the knife. If you are looking forward to investing in a high-grade sushi knife then this is the right one to go for. The Yanagiba sushi knife is a classic creation of Dalstrong. This super thin and sharp knife has been crafted to produce the finest slices of sashimi and is a perfect contribution to the Japanese culinary art. 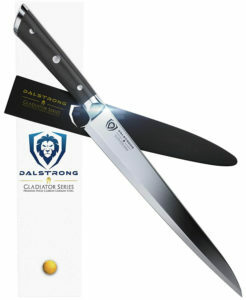 This knife is the part of Dalstrong gladiator series 10.5. 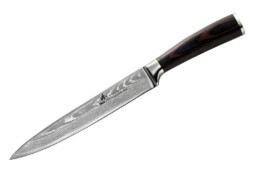 The knife has been made from German high carbon steel due to which the blades are so sharp and strong. 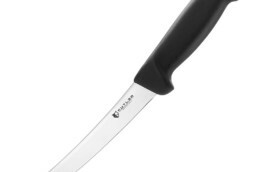 This knife has been christened by the name of slicing master due to its quality and single beveled edge feature. This has been specially designed to fit the requirements of the Japanese cuisine of creating sushi platters. The size of the blade is 3.5 mm and as it is beveled only in one side, the food doesn’t get a chance to stick on the blade. 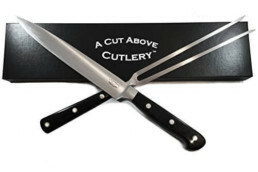 This makes the knife suitable for slicing raw fish and filleting delicate meats with absolute precision. As the knife has been forged from a single full tang, it is extremely strong and rigid and you only need to put the slightest of effort to run it through the fish. The classy black ergonomically produced handles are comfortable to hold even for hours. So if you have a weakness for tasty sushi and sashimi, then do not waste time and grab this spectacular knife right now. The Yoshihiro hammered knife another amazing sushi knife that you can consider getting for your kitchen if you are a sushi lover. 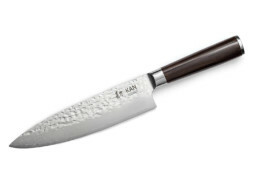 The knife is crafted with high-quality materials and is ideal to slice through raw fish with precision. This Yoshihiro knife has been made by accompanying 16 layers of hammered Damascus. The hammered edges prevent the food from hanging onto the blade. This knife has a double-edged blade so you can not only slice sashimi but also the sushi rolls that have other components as well. The mahogany handle has been properly riveted to the blade and is very comfortable to hold on to even for long periods of time. 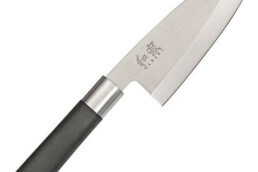 If you are looking for a versatile sushi and sashimi knife then you can confidently opt in for this Yoshihiro slicer. It is high quality and cuts the fish with meticulousness. When you want to create the perfect sushi platter there are certain things that you need to take care of. Great sushi is the one that not only tastes delicious but looks sharp and precise. The taste of the sushi also depends on the cut of the fish. A slightly thicker or thinner slice of fish can ruin the balance of the entire dish. To help you achieve that perfect slice of sushi, Sunlong has crafted this spectacular sushi and sashimi knife that can help you produce premium cuts of raw fish. The knife has been made from Japanese steel with 67 layers of Damascus. This makes the blade super sharp and resilient and is ideal to cut perfect slices of sashimi. The blade is 8-inches long and the steel core makes it very hard and strong. This blade is double sided and hence is ideal for anyone who uses right or left hand to handle the knife. The handle has been crafted from high-quality rosewood which is very comfortable to grip for long hours and doesn’t slip which slicing. If you are a fan of sushi and love to create professional-quality sashimi platters then this knife is absolutely safe to invest on. This is a Yanagi sashimi knife specially crafted to produce high-quality and precise pieces of fresh sashimi. Mercer Culinary is well known for their Sushi and sashimi knife collections and produces some fine quality knives for all the sushi lovers. The knife has a razor sharp blade that has been made from high carbon steel core from Germany. This material is very resilient and makes the blade stain proof and prevents rust or corrosion. The blade is made with a single edge which makes the cuts precise without causing a tear and also avoids the flesh from handing on to the blade. The blade has also been given a tapered fine stone finish. The Santoprene handle is excellent to hold onto while working for long hours and doesn’t slip while slicing the fish plus provides you with good balance over the knife. This knife is a good investment if you like to regularly create sashimi platters. This high-quality sushi knife is another great one to invest in if you want to achieve the professional grade sushi skills. A perfect piece of sushi depends on the cut of the fish and the preciseness. This is a high-end sushi knife by Yoshihiro and is widely used by Japanese professional chefs to produce quality sashimi. The blade is made from stainless steel with a higher percentage of carbon it in which makes it strong, sharp and durable. This knife is a Sujihiki slicer which is specially used in Japanese cuisine as a slicing tool. The narrow and sharp blade allows you to cut the fish smoothly without dragging or causing any tear. 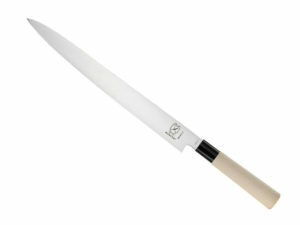 You can use this knife not just to make sashimi but you can also use it to carve roasted chicken and fillet fish as well. This slicer will last you a long time if you maintain it well and is totally worth the money. If you love the Japanese cuisine and authentic sushi and sashimi, then you can put your faith in this Yoshihiro sushi knife. Yehua is a brand that produces high-quality sashimi and sushi knives at an affordable price. This one is professional grade sashimi and sushi knife that has the ability to slice any fish, meat, fruits, and vegetables. This is a multipurpose knife which can be used for a variety of tasks. From cutting delicate raw fish to dicing vegetables and carving roasted chickens, you can do it all with this one knife and you can also use it to debone meat and fillet fish as well. 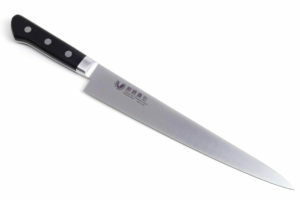 The knife comes with an 8 inch sharp, long and narrow blade that is ideal to do all the tasks that te the brand claims. The super sharp blades can help you to cut the perfect slices of sashimi and sushi rolls just like any professional chef. The ergonomic handle of this knife makes it very comfortable to hold on and work for longer hours and doesn’t slip while you are slicing the delicate raw fish. 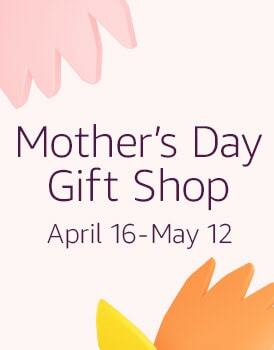 The handle is made from wood and provides excellent grip and balance. As the blade is made from high carbon stainless steel it will never rust or lose its shine over time. If you are someone looking for a good quality knife in a budget then this is the ideal one to choose. Yousunlong is famous for crafting high-end sashimi knives made from the most top quality materials. This gorgeous sashimi knife not only looks spectacular but is one of the best slicers that you can find in the market. The 10 inches sashimi knife has been crafted using Japanese high carbon stainless steel which is one of the best materials to make razor-sharp knives with. 67 layers of Damascus steel has been used to form one solid, strong blade. 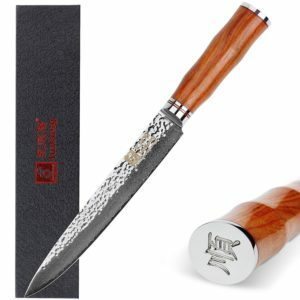 The knife has two different textured sides one of which has the Damascus texture and the other side has a hammered texture that minimizes dragging the delicate fish while slicing it and also prevents the flesh from clinging onto the blade. 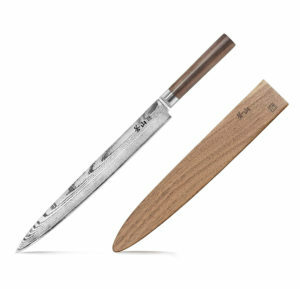 This knife is specially designed for slicing sashimi and won’t do justice if you want to use it for chopping purpose. The handle is made from a gorgeous ebony wood that enhances the outlook of the entire knife and also provides you with comfort while slicing. The handle helps to give you the right balance while you are slicing the sashimi. Overall, this is a classy and elegant looking knife with great performance level. It will not only enhance the look of your kitchen but will also give you the premium cut of sashimi to serve to your guests. For a sushi lover, it is ideal to invest in a good set of knives that will help you to do all the chopping and slicing that you need to do for creating tasty sushi. 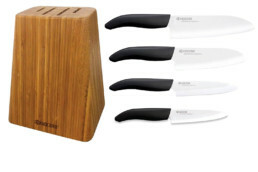 This knife set has the entire component that you will need to make professional grade sushi and sashimi. 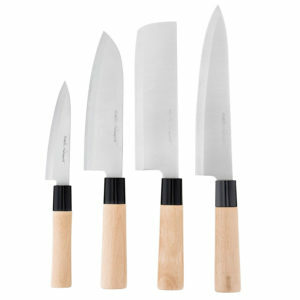 The set includes three classic sushi knives know by the names of Sashimi, Santoku and Nakiri knife. The knives have been made from stainless steel that contains a higher percentage of carbon in order to increase the strength and durability. These knives will never rust and corrode with time due to the material it is made up from and is ideal to add to your kitchen knife collection if you love sushi and sashimi. This 10.6 inches Yoshihiro knife has been specially crafted to help you to slice the perfect pieces of sashimi and sushi. This is a special Sujihiki knife which is particularly used for slicing raw fish for sushi and sashimi by the professional Japanese chefs. The handles have been well riveted to the blade to provide you with ultimate comfort and safety while you are handling the knife. This knife has a razor sharp blade which is long and narrow and is, therefore, the perfect tool to slice delicate fish and meat with. 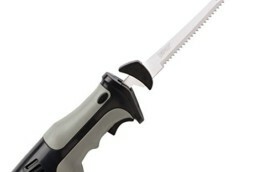 Its structure allows you to slice the fish without causing any tear or drag. It is an item that you can put your faith in if you love making sushi. While preparing the sushi, it is vital to choose a knife that you can comfortably use with the hand that you have command over. As most sushi knives come with a single beveled edge, it is important to see whether it fits your commanding hand or not. This KS&E Hasegawa stainless steel knife has been specially crafted for those who are left-handed. The single beveled edge is on the side where it complements those who used their left hand for slicing. The knife is made from the most high-grade stainless steel to enhance stability, strength, and durability. It is razor sharp and hence needs minimum effort while slicing the fish. So, for all the cooks who are looking for a high-quality knife that they can comfortably use even with the left land can definitely invest in this masterpiece. We totally understand how overwhelming it might be to choose one knife form the hundreds of others in the knife section of a shop. With so many options available it is very confusing to opt in for one particular knife. The above list consists of the most top quality sushi knives that is available in the marketplace. This will surely minimize your confusion and help you choose the ideal knife to invest your money in.